Montgomery Woods state Redwood Reserve is one of my favorite outings for a day trip. 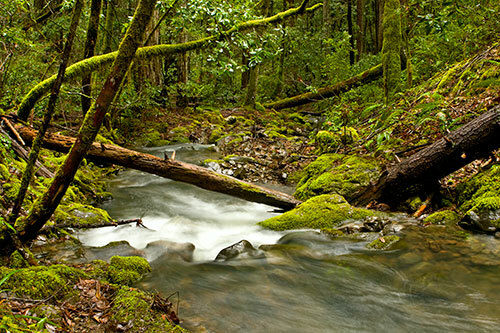 This true gem of a park is just 13 miles North-West of Ukiah on Orr Springs Road. Even with the best directions, this place is easily missed. The photography here is excellent, especially if you have a tripod and have the time for some long exposures. In fact this is so beautiful you may not even go any further on your first visit. From the picnic ground, the trail climbs rather steeply for about a quarter of a mile. At the top you will wander into a Valley of five Redwood Groves. This area has never been logged and you will feel the Spirituality of being in a very special place. The best time to come here is in the late Winter to early Spring, when the Creek flows through the park. In later Spring to Summer you might find Mosquitos! In Summer it can be very Hot, however it will always be cooler under the Redwoods! 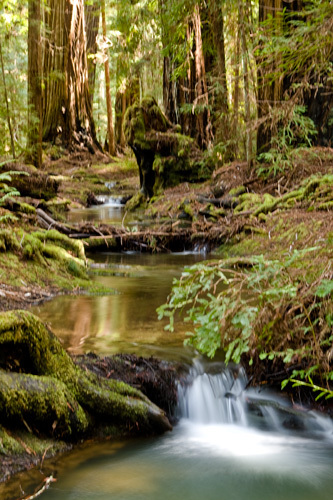 If you enjoy serenity in an un-crowded Spiritual Grove of some "Ent-like" giant Redwoods with a magical meandering silky creek, then this place is a must to visit!